Select Grades in the left-hand course menu. Select the wheel or gear icon in the upper, right-hand corner of the grade center. The Late Policies tab will now appear. Select automatically apply grade for missing submissions. Enter 0% for the Missing Submission Grade. 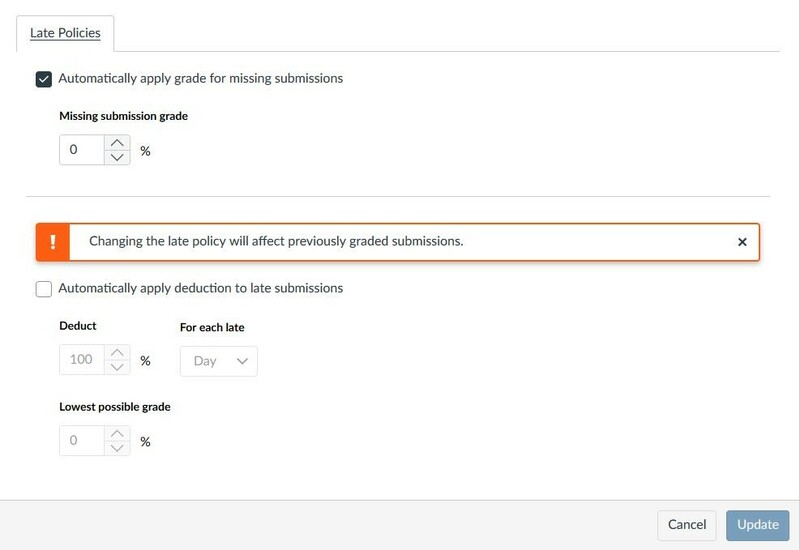 Canvas will now insert a 0 into any missing assignment cells after the due date has passed; however, students can still submit/resubmit if the assignment is still available. Why should I set this? Every cell in the Canvas grade center should have a number or value. If you have a cell that does not contain a grade, Canvas is not counting that assignment toward the final grade in your total column. *If you set the late policy at the end of the semester or after the submission, you will need to manually enter a ‘0’ in that column.